Blog reader Haden asks: "Everyone is familiar with the rule - the darkest light in the light has to be lighter than the lightest dark in the shadow. Keep the light and dark tonal ranges separate to show realistic form. But I've seen a lot of paintings when an object with a dark local value is pretty dark even though it's in the light." Joaquín Sorolla (1863-1923), "Sad Inheritance"
Haden continues: "Take for instance the Sorolla (painting above). The coat and the kids flesh are very different local values. According to that rule, the coat in the light should be lighter than the shadows on the kids (reflected light would be lightening their shadow sides a touch). But still the coat in the light is almost black, shouldn't it be a mid-grey?" "If the answer is paint it as you see it, then it's not really a rule, is it? Isn't it more just a general guideline for scenes with objects similar in local value? " Reply: Haden, you are very observant to notice that the Sorolla painting breaks the rule. I believe you are right. If this scene were actually staged outdoors in front of the sea with real people, the monk's cloak would be much lighter in the sunlight and the sea would be lighter and bluer. I found an alternate scan of the image which I would suppose is closer to the original, but even in this scan, the values of the cloak and the sea are still very dark. The best answer I can give is that rules are made to be broken. The rule should be understood first, and then ignored whenever the story demands. Here, because the form of the monk is not as important as those of the children, a simple dark shape suffices. This is what Andrew Wyeth and other artists describe as "going beyond the facts." The painting "Sad Inheritance" is about the frailty of the human condition, the triumph of the spirit, and the gift of compassion. These are all fairly sober themes, calling for a sober palette of color and value. 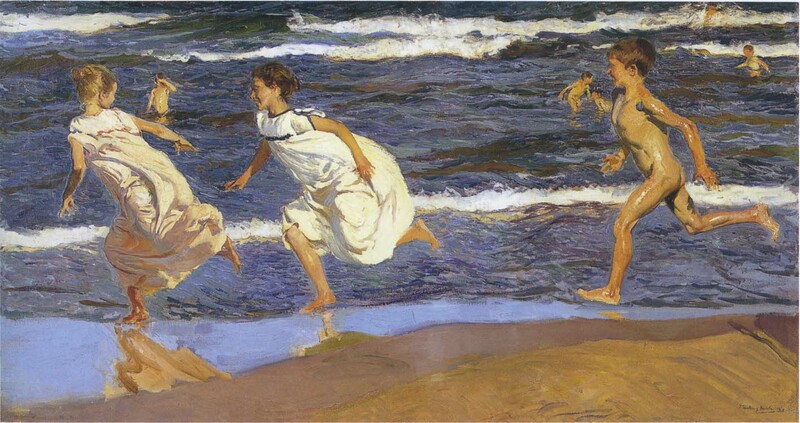 Sorolla tells a very different story in this painting of children running along the beach. It communicates pure exuberance and energy. Like the other painting, the figures are front-lit, with the sea behind them. But (assuming these scans are accurate) here the blue colors are stronger, and the foam is purer white, creating a more carefree mood. Sorolla's first sketch for "Sad Inheritance"
This is why it's so important to allow a composition to grow in the imagination or the memory before facing facts, regardless of whether those facts come from observation or photography. I'm glad to see discussion of this principle. Of all the "rules" i've come across, this one, for whatever reason, is the one that I find the least compelling when faced with actually making a picture. Also, I've just never been convinced that it's "true" when you consider that "the dark" areas include (for example) reflected light and "the light" areas include shadow. I've always tried to allow that very real possibility that I'm not completely grasping the point of the "rule", but it just hasn't been one that I find helpful. 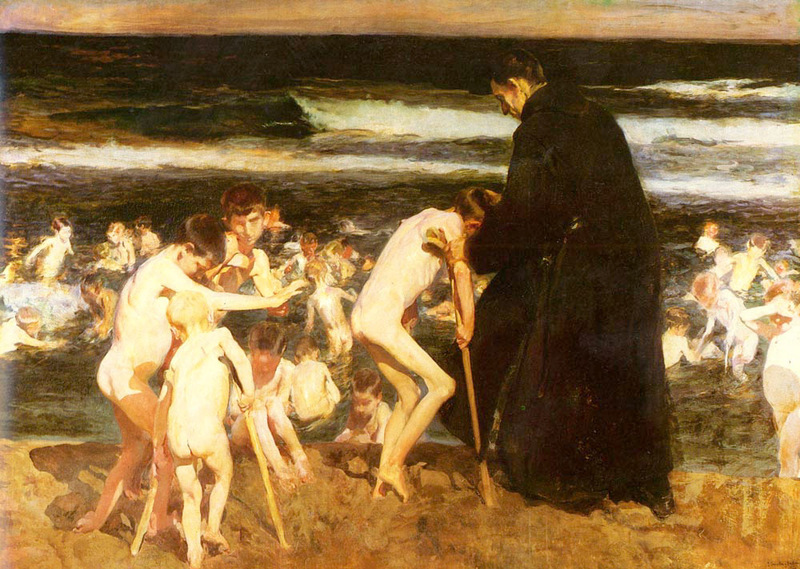 I don't think that Sorolla broke the "rule" in the painting with the monk. As I understand it, each object will have its own local color, highlight and shadow. Not that all objects in the light (or shadow) will have the same values. So looking at the painting, no value in the shaded portion of the cloak is lighter than the sun-lit part. Same is true of how he treated the children's flesh tones. He may have accentuated the contrast between the two, but he didn't break the rule to do so. I find it very funny, the phenomenon of people learning how to paint, seem to get very excited when something breaks the "rules". LOOK, THIS OLD MASTER PUT SOMETHING IN THE MIDDLE OF THE COMPOSITION! Or whatever. Actually it's probably even broader than that, people just seem to enjoy pointing out someone being wrong. 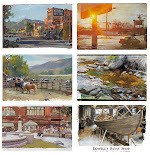 Before I pass on knowledge of art, I usually begin with the disclaimer "There are a lot of ways to make art, there are brilliant paintings that do the opposite of what I am saying"
I've really enjoyed this post and the subsequent comments. I've only recently learned this rule, and I've had the same qualms about it as mentioned above. 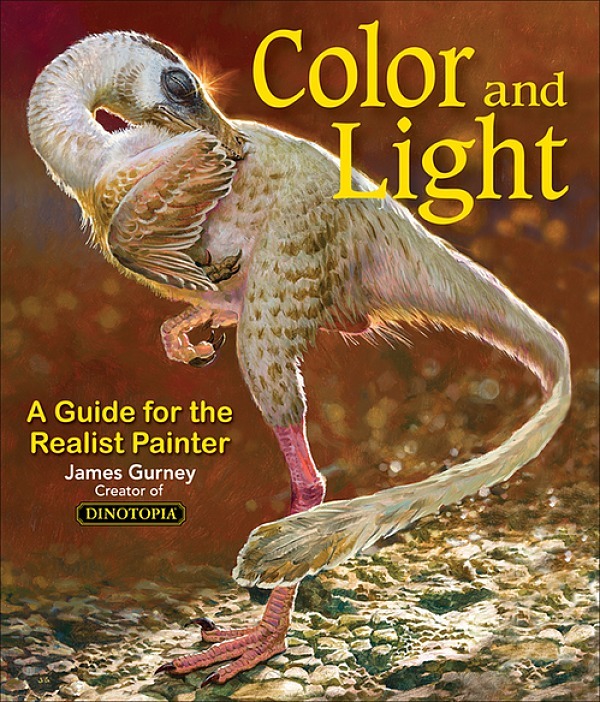 It's not the same rule, but another rule I find hard to accept that the lightest light and the darkest dark are always the center of interest, along with brightest color and most detail/sharpest edges. My eye is not always drawn to the lightest light/darkest dark first; nor does that always become my center of interest in a painting. I'm interested to hear what you have to say about this, James. It's like a lot of rules in art from composition to perspective - learn them, then learn how to break them. I like Watson's 'How to Use Creative Perspective' because he shows how illustrators have broken the rules to create more dramatic results. I seem to recall you once wrote a nice article with a racing car demonstrating the breaking of rules to make the ellipses of the wheels produce the illusion of speed and movement. Apart from 'going beyond the facts', which I believe is very important, the answer is really spotting the two mistakes Haden did in posing the question. The first mistake is that, like Kevin Mizner commented above, this particular rule (as I understand it) really has to do with light and shadow on a single object of uniform local value. I.e. the lightest part of reflected light in the shadow portion of a white sphere should never be lighter than the darkest part of midtone on the light side, next to the terminator. This rule applies on a relatively matte object lit by a single light source. 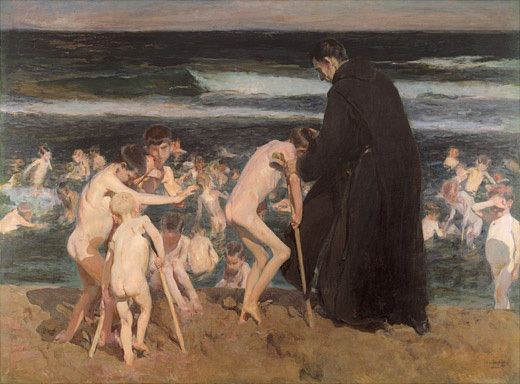 The other problem with the question is that even when looking at the different local values of the black cloak and the light skin, Sorolla isn't breaking the rule as stated. According to the rule, the values should be ordered like this: dark dark, light dark, dark light, light light. And that is how they are ordered in the painting. Dark black, slightly lighter black, dark orange flesh in shadow, almost white flesh in light. In other words, Haden got the rule mixed up when he said "According to that rule, the coat in the light should be lighter than the shadows on the kids", because according to the rule - even if it were applied to different local colours - the shadows of the kids should be lighter than the light dark of the coat. That said, the lesson about going beyond the facts can still be gleaned from looking at this painting. As James pointed out, the values of the coat are compressed together, simplifying the shape. But the deviation from nature is just moving two values closer to each other, not inverting their order. Thanks, everyone, for adding these insights and nuances. There really are two rules at play here. As David points out, one of them is: A given form (of a given local color and reasonably matte surface in direct sunlight without too much reflected light) will be no darker on the light side than the lightest value of the shadow. Note all those qualifications. It doesn't apply to a highly reflective red car for instance, where highlights in shadow can be far lighter than the darker halftones in the light side. Sorolla doesn't break this rule. ...but the conditions have to be ideal for it to bear out in fact. I would not be too quick to toss out these rules without good reason. The value of both of these rules is very great for both painting students and professionals because they act as a corrective to overmodeling and dividing the shadows with too many lights. As Jim pointed out in his "Black is Light and White is Dark" blog entry, in order for a black object in light to be darker than a white object in shadow, conditions had to be ideal. I have taken numerous photos to try and teach this principle and unless the black object was very reflective, the rule never came close to working. I believe that the statements made by earlier posters is more accurate - the rule applies to a single object or objects of similar "local" value. One reason that this "rule" is taught is that it makes for a clearer drawing or painting, where the delineation of light and shadow is important. It is a "rule" about painting - not a "rule" about reality. That is where the confusion occurs, in my opinion. In reality, conditions need to be ideal for any part of a very dark object to be lighter than a very light object in shadow. Thank you James. Plain air painter, Kevin McPherson also graphically describes this principal in one of his books. It shouldn't be disregarded on a whim. Thanks James, 'going beyond the facts' describes it quite nicely. 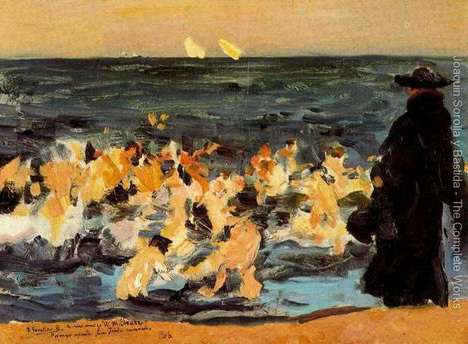 So Sorolla has darkened the value of the coat in light and the sea for emotional effect. Some interesting replies. I was referring to this 'rule' in terms of picturemaking. Its like how Vilppu says you have to go out of your way in trying to define space when making a picture. It may have been a Loomis book where i read it articulated the best, if you've only got 10 values to make a picture, you separate the value step ranges (objects of normal surface material) and everything in shadow occupies values 2-4 and everything in light say 6-9, this results in a strong graphic reading of light vs shadow and thus form. It makes sense to me thats why i am always interested in finding out why artists like Sorolla appear to have disregarded it in particular works.